E arthTalk: What is Project Save Our Surf and what inspired you to start it? Tanna Frederick: Project Save Our Surf is dedicated to the conservation of our oceans, fresh water and the delicate marine ecosystems the reside therein. We are surfers, friends, families and businesses who together believe that through education, awareness outreach and involvement we can generate significant change on our plant and youth. I went surfing at Santa Monica Beach, and paddled out to a floating dirty diaper . The water was dirty and trash floating all around me. I was sick for a couple of weeks after surfing. I started Project Save Our Surf to help our beaches and provide programs to friends, family, communities and the youth and educate them on making our beaches safe and clean. I also wanted to share one of my passions, surfing, with the children and teens. 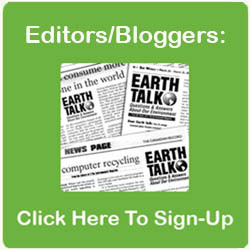 EarthTalk: Describe the group’s main projects/programs and how you gauge their effectiveness? Our main projects for 2016 is our camps and youth programs. TF: It’s hard to care about conserving the environment if you’ve never had a chance to experience its wonders. With that in mind, we created Camp PSOS, which exposes underprivileged and inner city youth to the wetlands and wilderness of California. Using fun, hands-on projects, we hope to not only engage campers on environmental issues, but to instill in them with the desire to fight for positive environmental change. Camp PSOS is an organization with nearly 20 years of experience empowering students, teachers and communities to connect with the nature. Through storytelling and live animal and science labs, they bring science concepts to life and serve over 125,000 California students each year. Our beach camps are also provided to underprivileged and special needs children and teens. We share the experience of the ocean with those in need. For most of the children, it’s there first time going to the beach. Project Save Our Surf’s Beach Camp is provided to special needs and underprivileged children though out the world. Our beach camps provides water therapy through guided surf instruction and hands-on beach clean ups to educate the children on plastic and recycle issues. They experience the true “stoke” of surfing. The children and teens gain self confidence skills and are educated on news ways to reuse and recycle.While our initial focus was on cleaning up the oceans, we expanded our fight for clean water to include something that should never be a luxury — access to safe water. We have 14 orphanages were working with in Vietnam and the Social and Labor Board providing water filters, so the orphanages, schools, villages and families can have fresh clean water. When our team installs the filters, we also educate them on clean water and sanitation. In 2016, we have our first youth program with our water filter program. We will be taking 14 teenagers to El Salvador to provide water filters to two schools and several families. EarthTalk: What are some things any of us can do to protect our oceans, even if we live far from the coast? TF: I think its important to educate our youth about runoffs, recycle and plastic. The youth is our future and they need to have hands on experience and be educated. More households need to recycle and reuse. I also think it’s important for communities to be involved in trash clean ups and educate their community, especially if they have rivers that flow and run into the ocean. It affects the marine life. Especially products that are being used with rice-beads. EarthTalk: Have your environmental leanings influenced any aspects of your career in the theater and film? TF: Yes, knowing what the runoff and plastic does to the marine life and humans, I try to educate as many friends and fans as possible and share my experience with them, with hopes that they would like to be involved with my nonprofit Project Save Our Surf and help make our beaches cleaner and plastic free.